alaTest ha recogido y analizado 153 comentarios relacionados al producto Kitvision Escape HD 5. En promedio, la calificación para este producto es 4.1/5, al ser comparado con la calificación 4.0/5 de otros productos en la categoria Filmadoras. Los usuarios están encantados con la batería y la portabilidad. La calidad de la imagen y la funcionalidad también consigue buenas revisiones. La fiabilidad consigue comentarios negativas y hay algunos comentarios heterogéneos respecto a la memoria. Analizamos las valoraciones de los usuarios y los expertos, la edad del producto y demás factores. Comparado con otros Filmadoras el Kitvision Escape HD 5 recibe una alaScore™ global de 89/100 = calidad muy buena. Item was delivered and handed back for a refund24 hours later, there is too much overexposure and pixilation. The iPhone app that is supposed to support this device doesn't even have it listed. Don't waste your money. The build qualitj is great solid piece of equipment wanted it to record video in my workshop, so the dust proof waterproof housing is great again built very well and records in 4k quality is great and for the sale price very pleases. Not amazing, and can't hear the sound on play back, but can hear it once the videos are uploaded to laptop. Actually really good for the price. 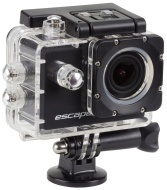 Bought this for using on a trip to Center Parcs end July..Took some great photos and videos.. Amazing quality.. Attached it to the bike and used it in the pool for underwater shots.. Definitely recommend..